“We are teachers,” said Rose Mugenyi repeatedly in an apologetic manner. It was her way of explaining her family’s humble home. The fact is, Rose and her husband, Paul, both age 48, have done remarkably well for themselves. In April of 2017, they moved to the rural part of Nsangi outside of Kampala, Uganda. Using bank loans, they bought a plot of land and constructed a seven-room home with brick walls and a tin roof. Though they are still making loan payments and much of the house construction remains to be done, it is a significant accomplishment for this warm and friendly couple. Rose teaches business in a private secondary school while Paul teaches biology and chemistry in a government secondary school. He leaves the house at 4:30 am each day to make the 50-mile one-way commute to his school using public transportation. Rose and Paul have six children, ages six to 15, all of whom attend boarding schools. 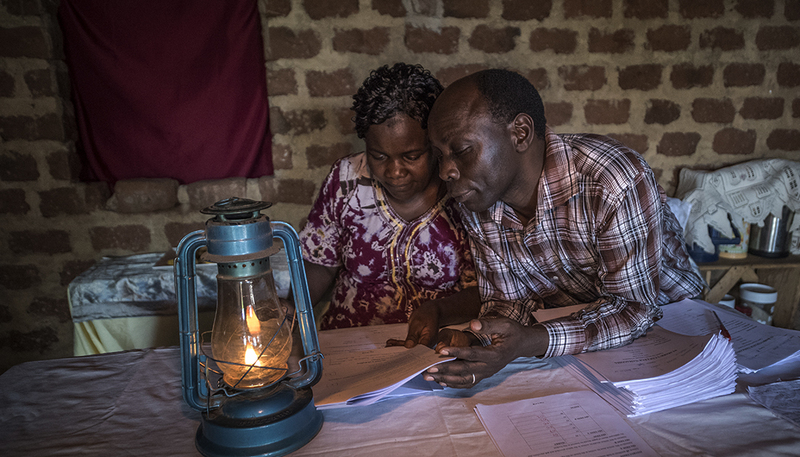 Rose and Paul Mugenyi, both teachers, huddle over their kerosene lamp to grade their students’ papers. Not long ago, Rose and Paul were using kerosene lanterns to light their home, but the light was too dim to work in. The kerosene fumes were toxic and produced lots of smoke that would cling to their clothing. Their six children, who would all gather together around the single table, struggled to read their schoolbooks. And Rose and Paul found it much too difficult to grade papers and exams in such conditions. “It was very uncomfortable,” recalled Rose. 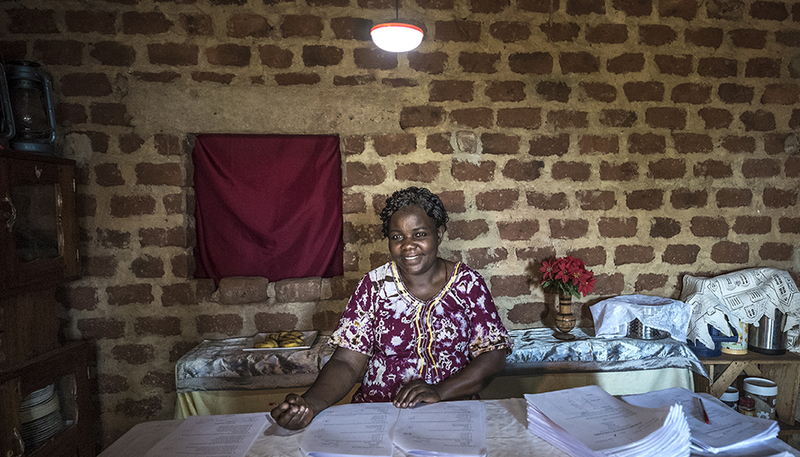 Thanks to a recommendation from a friend, Rose and Paul were introduced to a range of solar lighting products from BrightLife. They soon realized there was a better way to live. They initially started with a small solar home system and a portable solar lantern. And in 2018, they upgraded their home to a four-lamp home solar system. Now, getting light has never been easier or faster. We just flip the switch and we have plenty of light. These days, the duo can comfortably grade papers in the early morning and evening when it is dark. Their children can study while at home from boarding school on scheduled breaks. And the family is saving money. Rose and Paul estimate they keep an extra 20,000 Ugandan Shillings (about $5.40) per month in their wallet, which goes toward paying off the loan they acquired to purchase their land. Looking ahead, Rose and Paul are excited about their family’s future. First, they want to finish the land payments. Second, they wish to construct a security wall around their home. Finally, they will finish plastering the home’s walls, put down a proper floor and add a gypsum ceiling to each room.